Office applications are not closed entities that do not interact with other applications. Various elements created by other applications can be imported into an office document, such as a graphic or image. Other applications, such as financial software, can import office documents as well. The focus of this article how applications outside an office suite can extend the capabilities of that suite. LibreOffice and Microsoft Office can import documents native formats of other applications. During the 1980s, software companies were started, developing application types that are popular today. During this time there were several popular operating systems and computer manufacturers. When Microsoft started to dominate the market in the 1990s and early 2000s, many of the companies went out of business, or they were bought out. For example, when the first Macintosh was released in 1984, its word processor MacWrite was one of the most popular on the market. However, in the 1990s, like many word processors it took a backseat to Microsoft Word. Many applications were discontinued due to Microsoft Office’s market share, and many people and organizations did not migrate their old documents to active applications and formats. As technology evolved, and they acquired new technology, many old documents could no longer be opened. This is one aspect of data rot, when data can no longer be accessed. A YouTube video gives more details. Now there is much less concern over data rot. Office suites are almost as old as the personal computer, and like the personal computer, they have evolved over the decades. Modern office suites can open and edit universal formats and directly connect to the Internet. Two of the most popular office suites are free for everyone and work well with each other: LibreOffice and Google Drive. Both are compatible with almost every operating system. LibreOffice was designed to work equally well on Windows, Mac, Linux distros, and several other operating systems. Google Drive can be interacted with most Web browsers. It officially supports FireFox, Chrome, Safari, Explorer, and Edge. Firefox and Chrome have versions for the previously mentioned operating systems. One key difference between LibreOffice and Microsoft Office are the organizations behind them. Office is owned by one of the largest technology companies in the world. It charges for its office suite and gives the version that runs on its operating system the most features and applications. The corporation’s goal is to sell its latest versions of Office to as many people as possible. LibreOffice is developed by the Document Foundation, a non-profit organization with a guiding manifesto that posits that everyone should have equal access to an office suite, regardless of their ability to pay or their native language. It also maintains that the individual user should retain intellectual property rights over their documents, as stated in its manifesto. The non-profit nature of LibreOffice has made the suite a good digital preservation tool. Digital preservation is a process of making sure digital information is usable and accessible, regardless of the applications used to create it are still available or not. LibreOffice uses open formats and standards, which are essential to digital preservation, and digital preservation is important to retaining an individual’s intellectual property rights. Many users have temporarily lost their property rights because they have old documents in formats from office applications that are defunct, or newer versions of applications no longer support their old formats. When you click Open in one of LibreOffice’s applications and click File drop-down menu, a list with more than 100 formats will appear. This list is composed of modern and legacy formats for text editors, spreadsheet, and presentation applications. 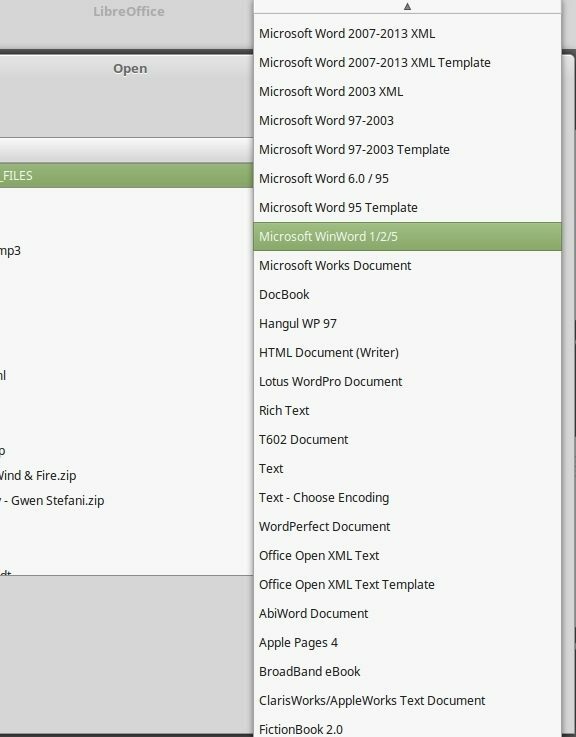 The files drop-down menu in LibreOffice has more than 100 formats for text, spreadsheet, presentation, and other documents. Microsoft Word, Excel, and PowerPoint formats are in the list, of course, but it also includes Apple Pages, Numbers, and Keynote, as well as Corel WordPerfect, Quattro Pro 6.0, and several other Corel formats. Some of the legacy formats include Lotus WordPro and 1-2-3, ClarisWorks/AppleWorks, and Microsoft Works. LibreOffice supports all of these formats because the Document Foundation values users retaining intellectual property rights. It allows them to open their documents and migrate them to open formats, such as OpenDocument Text. OS-College has a Web page with the list of formats for LibreOffice. Microsoft Office does not have an exstensive list of formats like LibreOffice has, though version 2016 can open Office 97-2003 format documents in compatibility mode, and they can be converted to the latest Office formats (XML-based and open) or OpenDocument Formats. The latest version cannot open older Microsoft formats, however. The XML formats that Microsoft has been its standard for that past decade or so are easier to examine with other applications than their previous ones. However, it has zero interest in allowing users to open legacy formats from other office applications, so they can migrate them to these XML formats. This means that LibreOffice is a better preservation tool than Microsoft Office. While this may not be a reason to ditch the most popular office suite in the world for the open-source one. It may be a reason to include the latter in your toolbox of applications. You can use LibreOffice, either by installing it or running the PortableApps version on a USB drive, to open the older documents and migrate them to and OpenDocument or office open format (docx, xlsx, pptx). This can be done by simply performing a Save As.